Then you're ready for IdiomaX Dictionary (Spanish-Italian) 6.0. Once you have downloaded and begun using this comprehensive Dictionary software, your colleagues, boss, family and friends will marvel at your newfound confidence and language proficiency. You'll discover that it actually can be fun and not a chore to learn new languages like Italian, Spanish and French... and to have instant translation of words and phrases right at your fingertips. Look up words and expressions. Add a translation dictionary bar on your screen to drag and drop a word or phrase you want to translate. Help you learn, not just translate, a language. The revolutionary IdiomaX Mobile Translator. It downloads easily onto your SmartPhone or Pocket PC and goes wherever you do. Stuck for a word or phrase when you're stuck in traffic? Need to translate an email at the lake or a document on a business trip? Mobile Translator is as close and convenient as your cell phone. 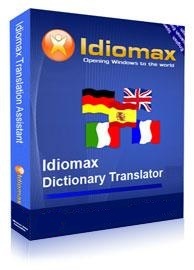 Special Price Offer: You get 10% off the Mobile Translator when purchased with the IdiomaX Dictionary. Check here now to include "IdiomaX Mobile Translator" with your order IdiomaX Dictionary and claim your HUGE 10% discount available to Dictionary customers ONLY!